Rather than sharing Christmas with his family, West Papuan political prisoner Yanto Awerkion wspent Christmas day in a prison cell in West Papua – all for signing a petition…. In May 2017, the Indonesian military stormed a peaceful West Papuan prayer gathering meeting and arrested Yanto Awerkion for collecting signatures for the West Papuan people’s petition calling for an internationally supervised vote on West Papuan self-determination (an independence referendum). Since then he has been held for over 6 months without charge, unable to see his wife and baby. His trials continue to be adjourned due to a lack of evidence, a lack of prosecution witnesses and even the lack of a judge! His next trial date is set for 23rd January. 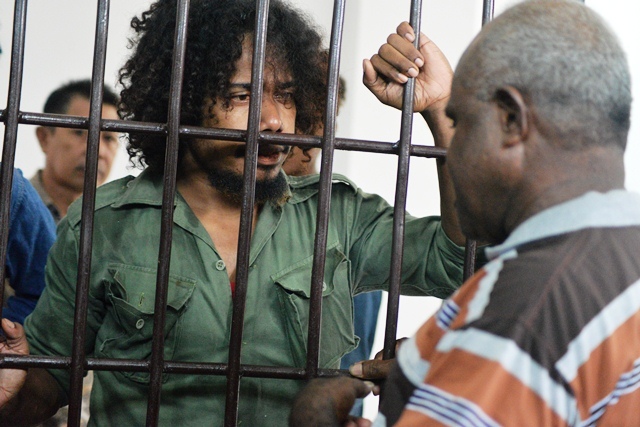 Support the Free West Papua Campaign to help free Yanto. On the 31st May 2017, as hundreds of people in Timika were gathered peacefully to hold a prayer and thanksgiving ceremony for the thousands of signatures in the Bomberay region of West Papua, collected manually for the West Papuan People’s Petition, the Indonesian military and police began to surround the church compound. As soon as the local West Papua National Committee (KNPB) deputy leader, Yanto Awerkion took to the stage, the Indonesian troops raided the compound. They were fully armed and made up of the Indonesian military, police, Detatchment 88 (“Anti Terror” troops), Kopassus (Special Troops) and Intelligence Services. For 6 months Yanto has been held without charge in prison. He is being told his “crime” of supporting the petition could amount to “treason” and the next 15 years in jail. Yanto is one of over 30 political prisoners currently being held in West Papua, for similar acts such as simply holding the West Papua national flag and peacefully advocating for an act of self-determination for West Papua. The Free West Papua Campaign work peacefully to bring awareness of the situation in West Papua by lobbying governments, international media and building international solidarity for West Papua’s right to self-determination, and freedom. Any donation you make will enable us to continue our critical work.